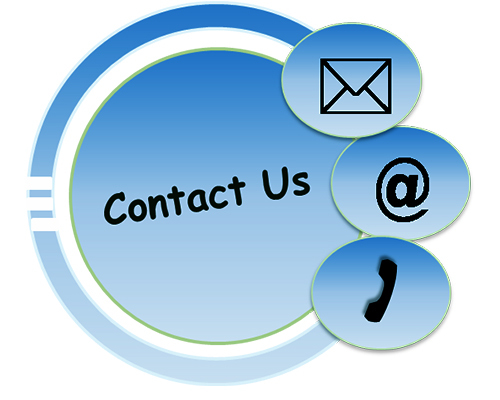 Every ozone generator has ratings to describe the output of ozone in relation to other ozone generators. These ratings are derived from performance testing of an ozone generator. 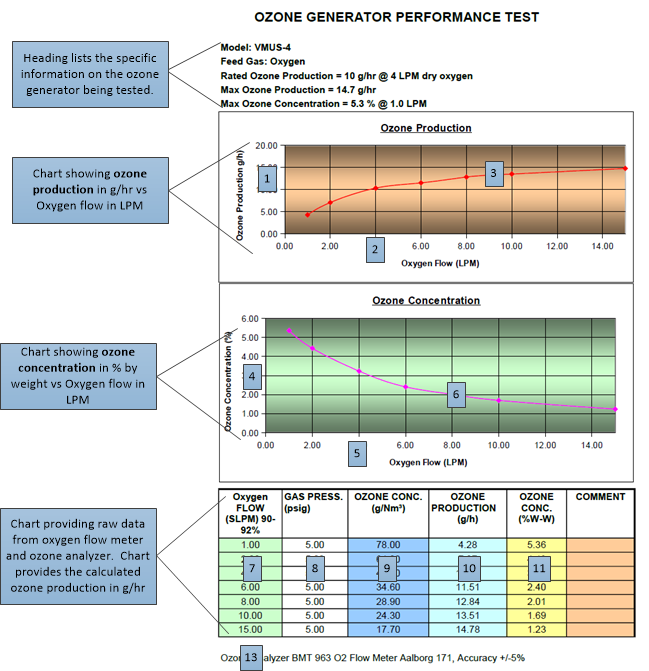 When ozone generators are tested a Performance Chart should be created to understand the performance of that ozone generator across the full scale of normal operation. 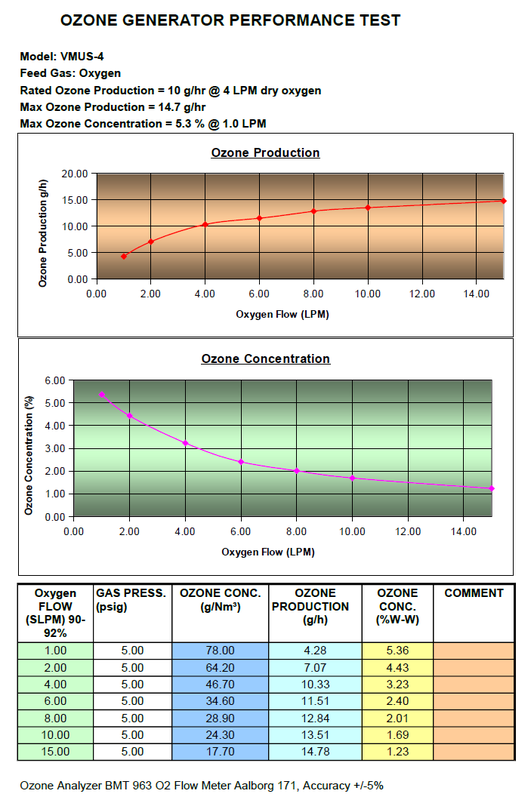 The chart below is an example of an ozone generator performance chart. This is the format we use at Oxidation Tech, you may have a different chart with a different format, however many of the same fundamentals will be the same. Graph shows the comparison of ozone generator output compared to feed-gas flow to show exact ozone generator output at any given flow. Typically ozone generator output (g/hr or lb/day) will increase as feed-gas flow (LPM or SCFH) increases. This will illustrate the feed-gas required for the ozone production you require for your application. Keep in mind, if ozone generator A requires ½ the oxygen flow as ozone generator B to produce the same ozone production, ozone generator A will cost less to operate long-term and be a better overall value. 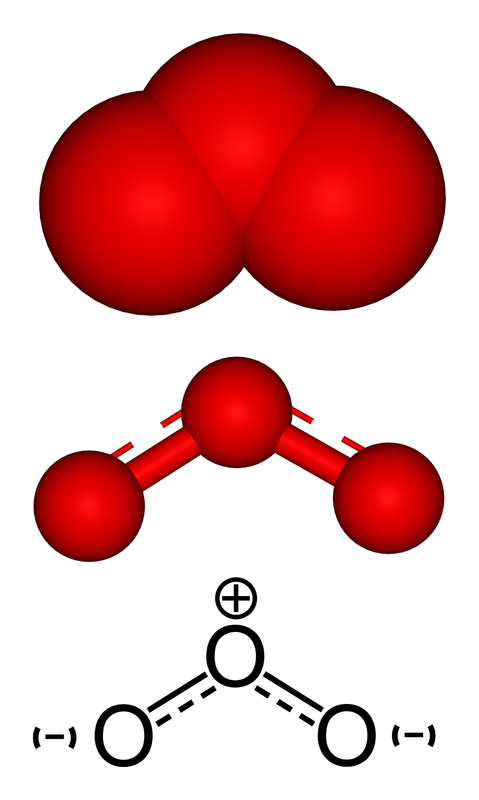 Keep in mind ozone dissolves into water more efficiently at higher ozone concentrations. Chart shows the raw data compiled during ozone generator testing. Data is obtained using a UV ozone analyzer, using a method such as what is illustrated in this link. Ozone Concentration at each flow rate is recorded. Ozone output is calculated from this data and shown on the chart also. Relevant information may also be shown on this chart such as feed-gas type, oxygen or dry-air, feed-gas pressure, and power consumption. Learn more about each of these variables HERE. See bullet point descriptions below for the description of each piece of information. Feed-gas flow shown on horizontal (X axis) on the graph in LPM or another flow measurement unit of measure. 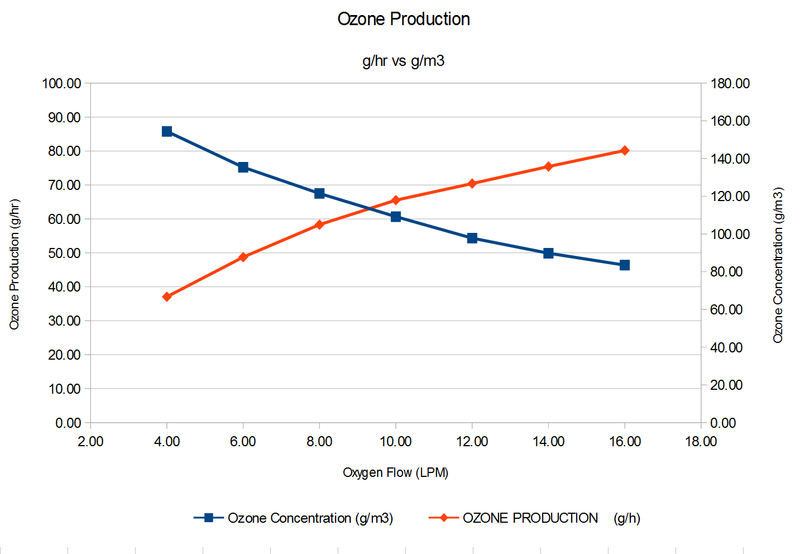 Ozone output in g/hr can be determined at a given flow-rate based on trend line shown on graph. Find your expected flow rate on the X axis, draw a vertical line straight up from this point to find the resulting ozone output at this flow rate. Ozone concentration shown on vertical (Y axis) on the graph in % by weight or g/me. Ozone concentration can be determined at any given flow-rate based on trend line shown on graph. Find your expected flow rate on the X axis, draw a vertical line straight up from this point to find the resulting ozone concentration at this flow rate. Raw data feed-gas pressure shown for testing purposes. 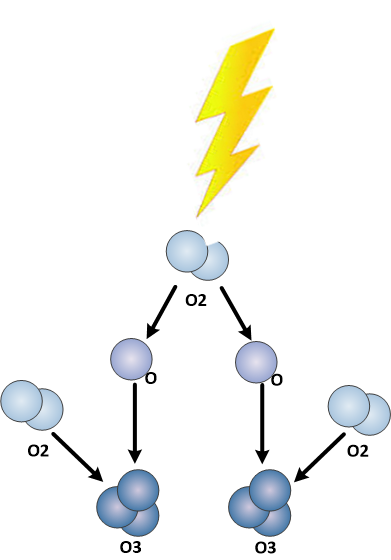 Some ozone generator will create different ozone outputs based on different pressures. Therefore, some charts will provide this data to illustrate the various differences in ozone output vs pressure. Ensure flow reading given is pressure compensated for accurate readings. Raw data ozone concentration is shown. This is the data provided by an ozone analyzer during ozone generator testing. See here to understand this method. Ozone generator output in g/hr (or another unit of measure) shown. This is calculated based on oxygen flow and ozone concentration. 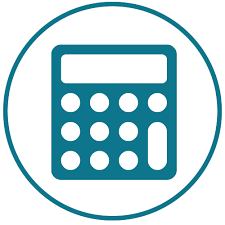 Online ozone output calculator HERE. Data provided on the ozone analyzer used to create a performance chart. This data, along with any additional relevant data should be provided for traceability. Some performance charts will lay the ozone concentration and ozone production on one graph as the one shown in the image below. If your performance chart looks like this don't sweat, it is easy to understand, we'll walk you through this. This chart uses two vertical (Y axis) scales to show ozone concentration and ozone output on the same chart. This can be convenient as it shows the direct relationship of ozone concentration to ozone production. However, this can also be confusing, especially when multiple pressures or power settings are shown on the same chart. When looking at this chart, remember the line that starts high on the left and moves downward must be the ozone concentration. As feed-gas flow increases, ozone concentration decreases. The line that starts low on the left and moves upward must be the ozone production. As feed-gas flow increases, ozone production increases. Take your time, review each line on it's own. Find the feed-gas flow you are using, draw a vertical line straight up from that flow, and find the ozone concentration or ozone production that lines intersects with. -How to test O3 production? -How to read performance chart?